Before there were mechanical and later electric washing machines everything had to be washed by hand. There was no soap powder, but a solution called lye was used. Lye softened the water and made any greasy marks dissolve more easily. Lye is a solution made from water and the alkaline salts produced by wood ash. Ash is all that is left after wood has been burned. Taken from the fireplace and placed on a cloth at the bottom of the lye dropper, water was poured over the ash and allowed to drip through the holes in the bottom of the dropper. The mixture of water and ash is strained and lye is the result. Washing with this solution was known as bucking with lye. Clothes were placed in a buck, or large bucket, and lye was poured over them. 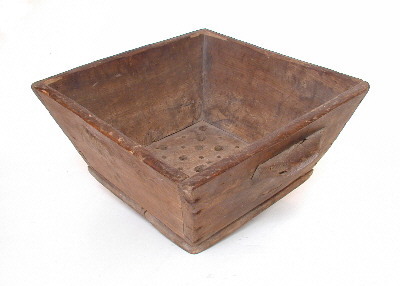 This method of washing, once used for everything, was later particularly used for children's clothes and table linen. Click on the image to the right to print out a picture to colour in.